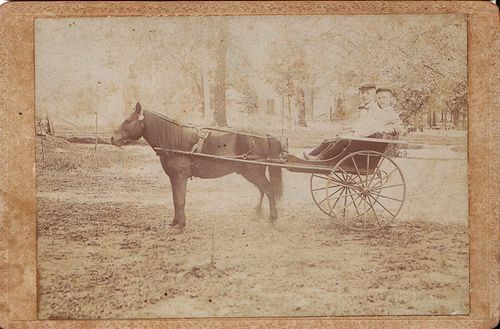 A photo dated August 26, 1901, shows brothers Norman Bates Reed and John Alois Reed Jr. sitting in a cart drawn by their pony, Sparkle. The view is from the back yard of their house at 304 N. College looking south across Dickson Street. Barely visible through the trees is the Baxter House, which stood where the modern Washington County Courthouse now stands. The two boys are the sons of John Alois Reed Sr. and Lena Bates Reed, and grandsons of George Washington Reed and Mary Jane Reed.